The illegal wildlife trade, also known as wildlife trafficking, is devastating for wildlife and human communities around the world. Increasing demand for wild animals and their parts threatens hundreds of species, such as elephants, tigers, pangolins, and macaws. 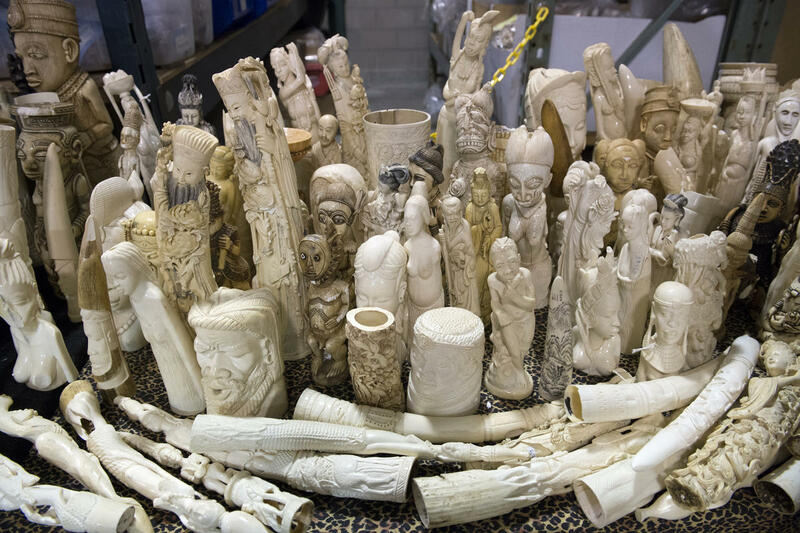 Wildlife trafficking benefits from corruption and weak governance along the trade chain, and it further weakens rule of law and security for communities living alongside wildlife and wild places. Our goal is to dismantle wildlife trafficking networks that drive the illegal hunting and illegal trade of endangered, threatened, or otherwise protected species. We seek to do this by a) increasing the risk of wildlife trafficking as a criminal, commercial enterprise by identifying, targeting and removing—through established judicial systems—the most important criminals in trafficking networks, and b) decreasing the potential reward for trafficking through legal reform in markets that criminals use to launder illegal wildlife. Our approach is proactive—our conservation work in the field helps us to evaluate potential and emerging threats to wildlife, and to refine our strategy accordingly. We work closely with government partners to combat wildlife trafficking in more than half of the 60+ countries where we have programs, including major source, transit and consumer countries in Asia, Africa and Latin America. We are developing sophisticated intelligence gathering and analysis capabilities in multiple regions to ensure that our interventions are successful and cost-effective. We have over 100 years of translating field conservation work into policy change at the national and international levels. WCS goes beyond disrupting wildlife trafficking at established choke points, which can change rapidly along with trade routes. Instead, we focus on gathering and managing information on the activities of wildlife trafficking networks and the criminals that run them, creating and sharing intelligence products with government enforcement agencies, and improving communications at the national and international scale to implement proactive enforcement activities. Our approach increasingly focuses on long-term support and mentoring, building on short-term capacity building or training workshops, and we help our government partners convert actionable intelligence into real action. This approach has already led to enhanced enforcement operations resulting in the successful arrest, prosecution, and conviction of targeted wildlife criminals in several countries, including Indonesia and the Republic of the Congo. WCS works at the national and international level to ensure that governments strengthen wildlife crime laws and improve their enforcement, as well as to make it more difficult for consumers to purchase illegally or unsustainably sourced wildlife products. We are working to ensure that criminal justice systems and relevant government agencies have robust laws and penalties for combatting wildlife crime (including wildlife trafficking) and that they follow through on legal procedures, including prosecution, conviction and sentencing of criminals convicted of wildlife crimes. At the international level, we work through intergovernmental treaties such as the Convention on International Trade in Endangered Species of Wild Fauna and Flora (CITES) and other fora (such as the United Nations General Assembly) on collaborative approaches to combat wildlife trafficking. WCS focuses on a suite of species that are of high commercial value, protected under national law or international treaties, and where we bring specific expertise and add value to ongoing efforts. Our efforts focus on African and Asian elephants; rhinoceroses; pangolins; big cats including tigers, lions, snow leopards, jaguars, pumas, and cheetahs; tortoises and freshwater turtles; helmeted hornbills; cage birds such as parrots and macaws; and sharks and rays. WCS works to combat wildlife trafficking of these species in about 30 countries in Asia, Africa, Latin America, North America and Europe—about half of the 60+ countries where we are engaging in field conservation action. WCS continuously reassesses our geographic engagement and CWT investments based on the intelligence collected and analyzed as we track criminal networks trafficking the species listed above. Increased capacity of our government partners to combat trafficking in high profile species will also improve enforcement for, and raise awareness of, lesser-known or less threatened species that may be at risk. WCS measures the impact of counter trafficking work through science-based monitoring efforts for many populations of key species (such as elephants and tigers), as well as ongoing efforts to track illegal killing and conduct market surveys of species in trade. These monitoring efforts for wildlife have also been critical in policy advocacy around illegal wildlife trade. In 2013, a WCS-led analysis of the shocking forest elephant decline in Central Africa was highly influential within CITES and in galvanizing government support for greater cooperation and action. More recently, WCS field researchers have documented the decline in wild populations of African grey parrots, and our anti-trafficking efforts helped convince the CITES Parties to transfer the species to Appendix I, banning international commercial trade from source countries.